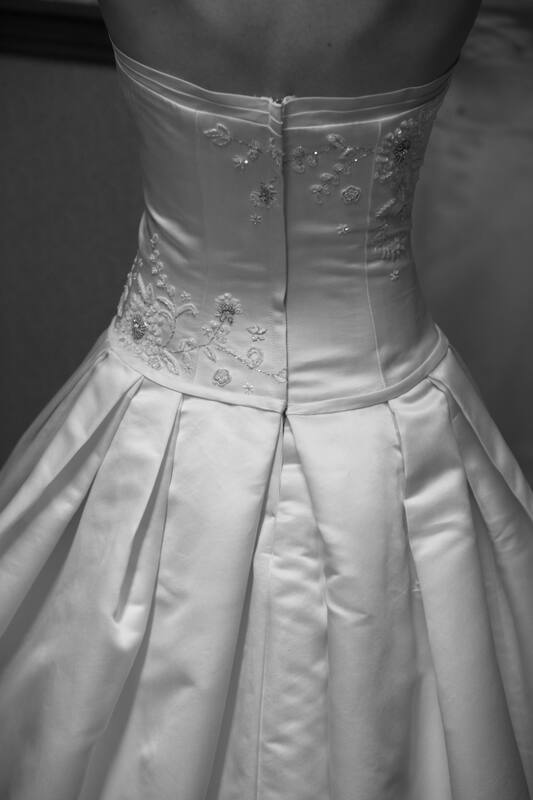 ← HAP Cordially Invites You to….Wedding Month! Adam and I got married on a beautiful rainy day in late September. Even with the uncooperative weather, we still had a perfect day! 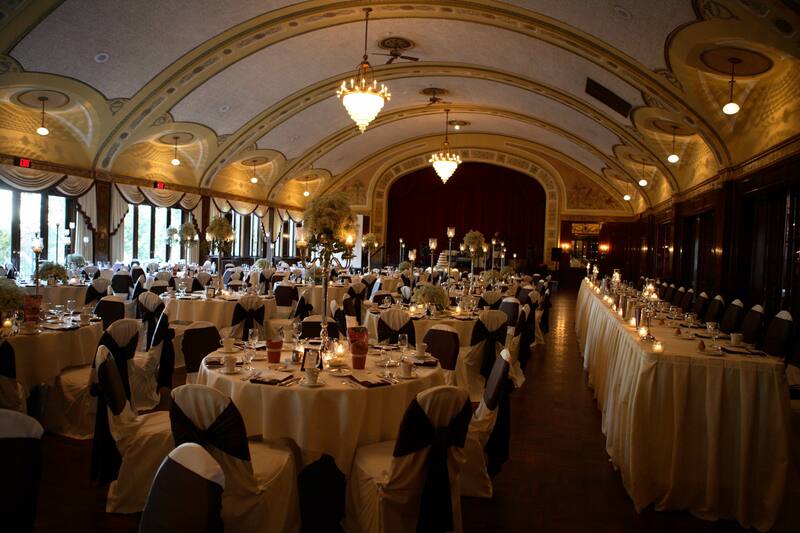 We had a brown and sage green wedding with the colors noticeable in every detail. 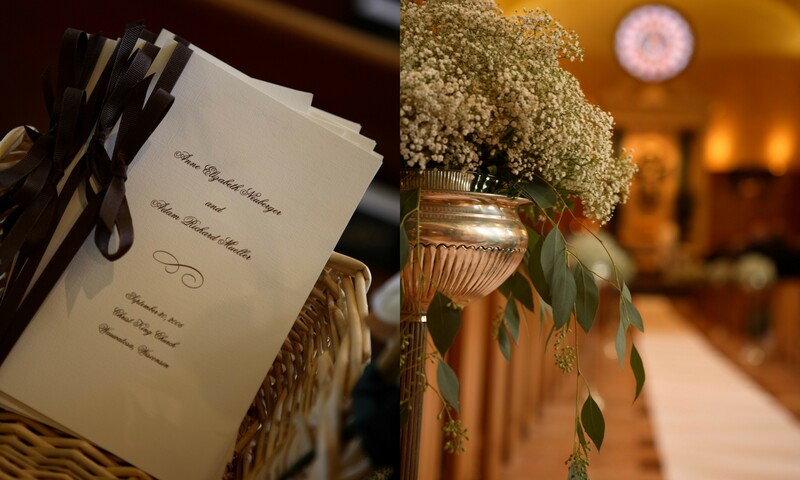 Inexpensive bunches of babies breath were a main focus of our wedding that gave the event an antique feel and helped keep us on budget. It was both fun and exhausting to plan, but looking back it was worth every minute! I carried a bouquet of ivory roses, lilies and green berries. I wore a dropped waist Melissa Sweet dress that was quite difficult to get into! 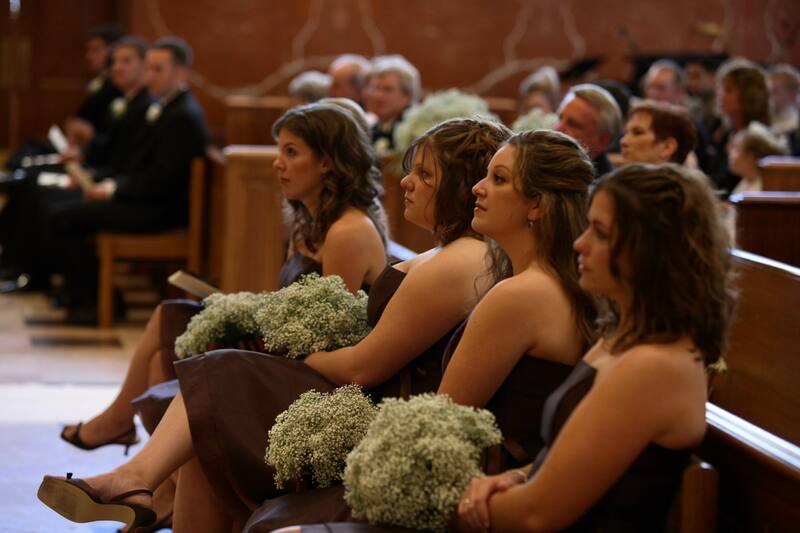 My beautiful bridesmaids wore brown tea length dresses and carried babies breath bouquets wrapped in brown ribbon. 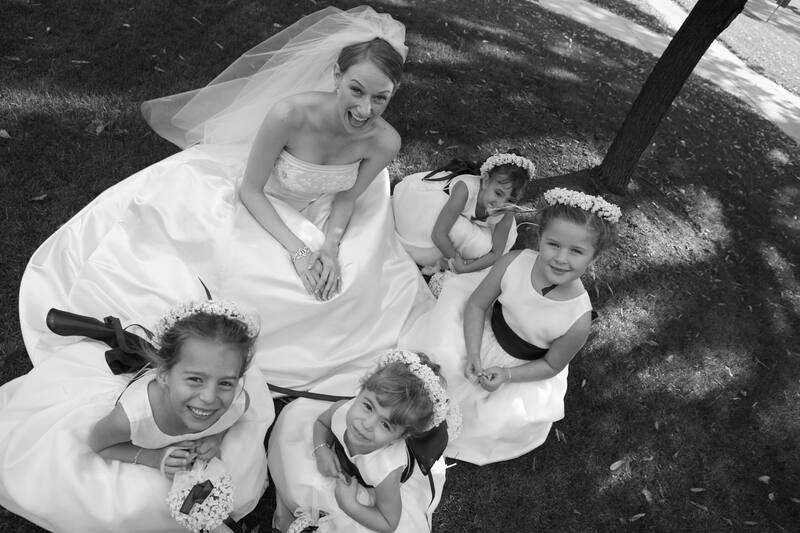 We had 4 adorable flower girls who wore ivory dresses with brown sashes and crowns of babies breath with brown ribbon accents. 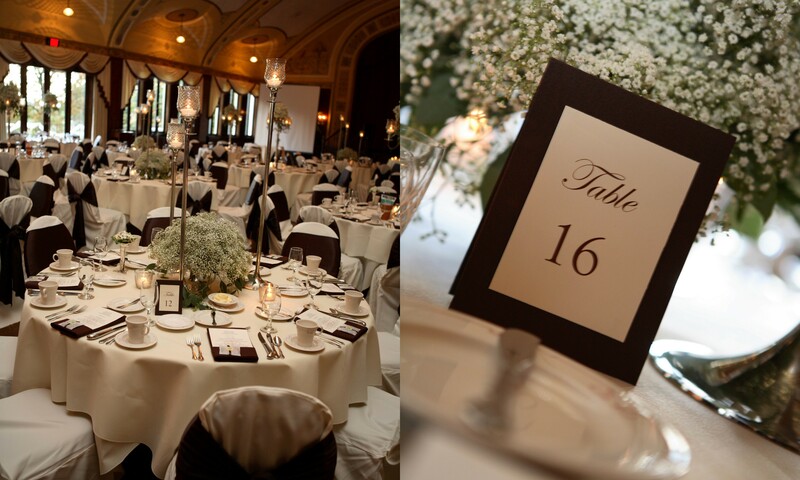 At the reception, tables and chairs were dressed in ivory tablecloths with brown accents. High and low bunches of babies breath and candles were on each table. 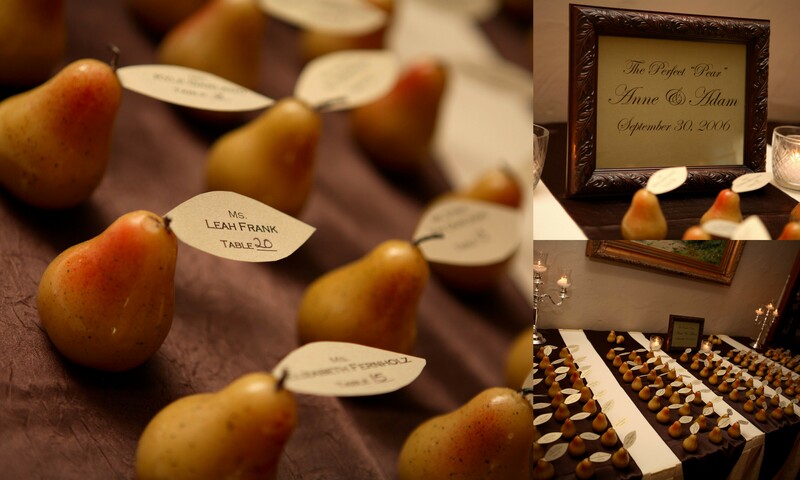 Our place cards were pear-shaped candles with the names and table numbers on each leaf. 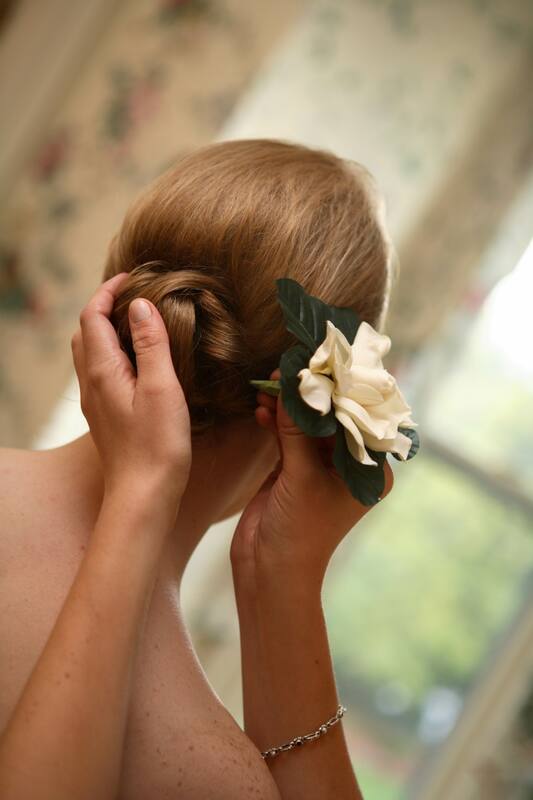 I swapped my veil for a fresh gardenia in my hair at the reception. 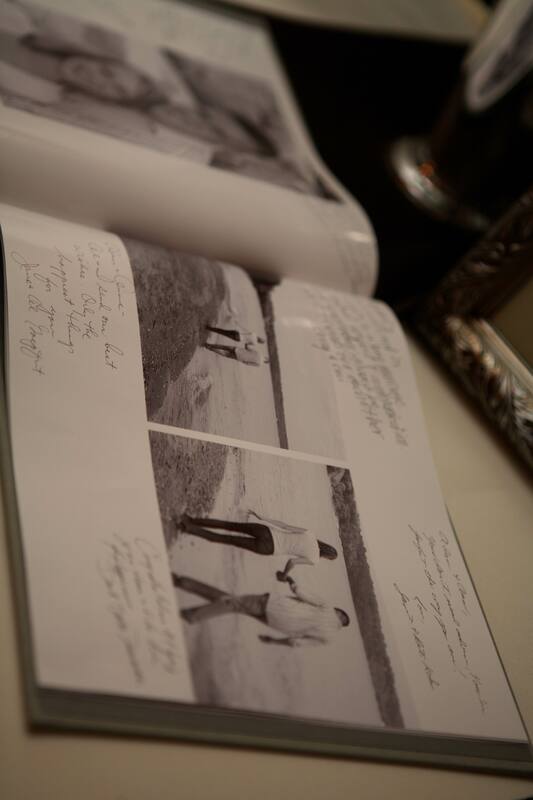 Our guest book was a photo album made on mypublisher and guests signed in between the pictures. 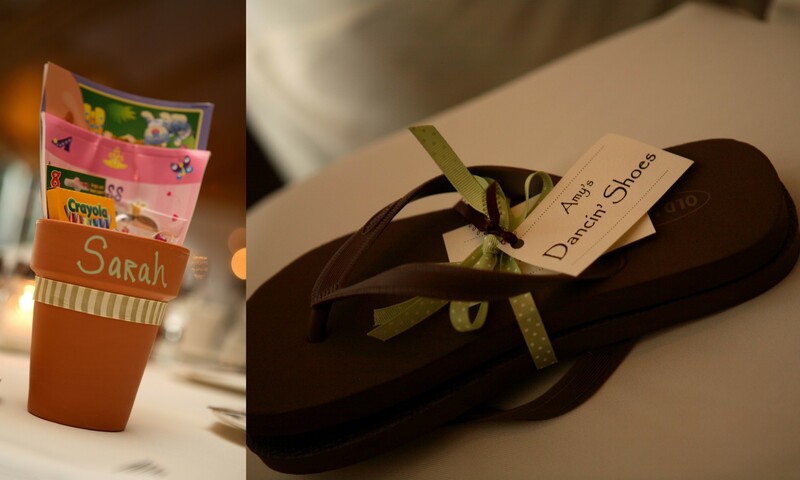 At the reception, the bridesmaids were treated to flip-flops for dancing and the flower girls had special gifts waiting at their table to help keep them occupied through dinner. 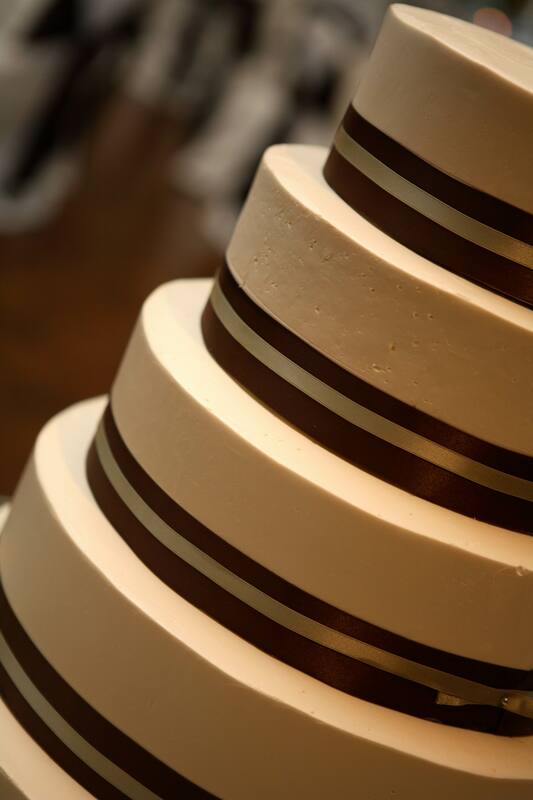 Our cake was simple with white icing and finished with brown and sage ribbon. 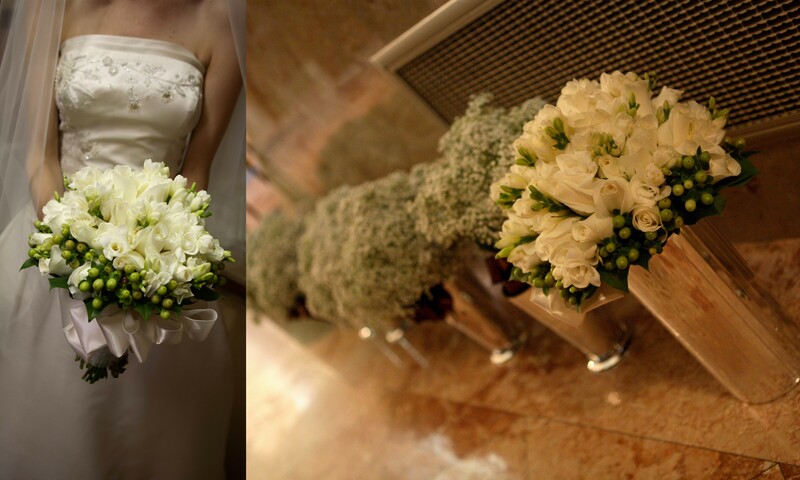 The bride and bridesmaid bouquets were put in vases and placed on the head table for decoration at the reception. 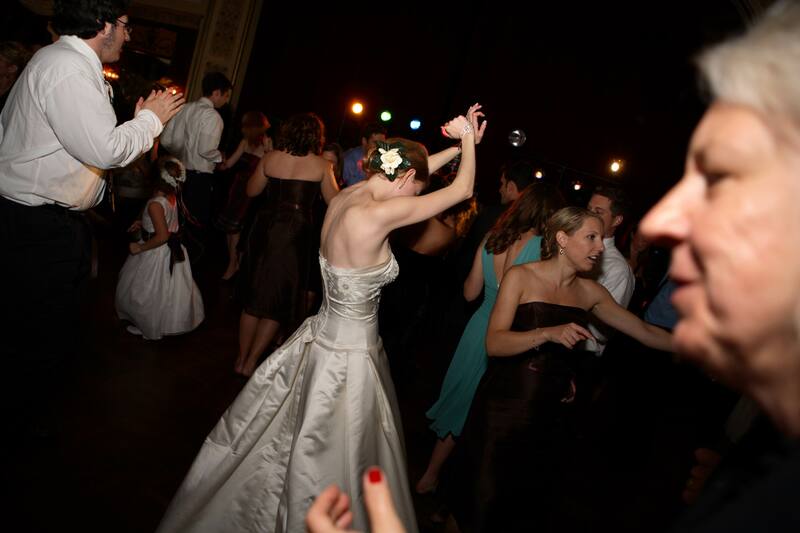 And like any great wedding, we spent the rest of the night on the dance floor! Looking back on our pictures reminds me of what an amazing day it was! Pictures were taken by the fabulous Sarah Immel. Love the ideas, After 22 years I still love my vintage 1950’s dress, which was worn by my Mom. We are (hopefully) years away from our kid’s weddings, but its still fun to see new ideas and colors etc… Keep up the great blog. Hey there! Just starting to plan my own wedding. Yah! Where was your reception? It looks gorgeous. As does everything! Thanks! 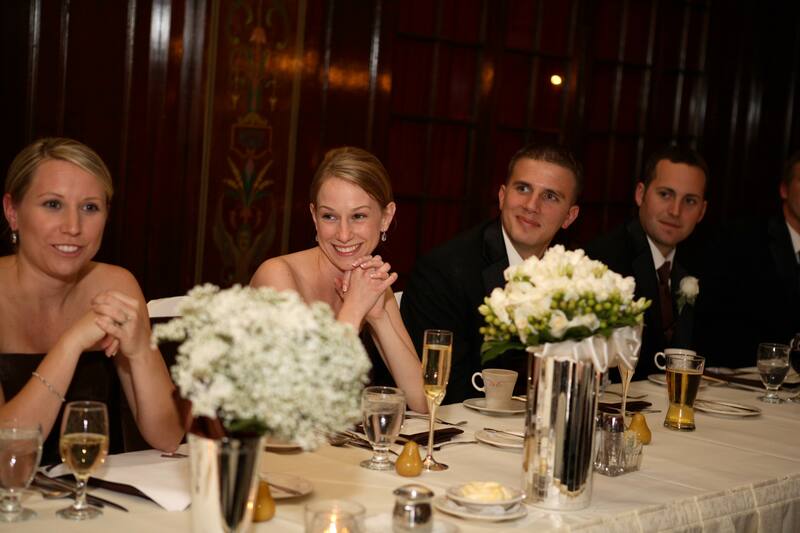 Our reception was at the Wisconsin Club in Milwaukee…we were so happy with the venue. Good luck with all of your planning! !